Do you See Changes in the Chattahoochee River watershed? The Chattahoochee River drains an immense area of 8,770 square miles — and we’re looking for people who can talk about the changes they’ve seen in the watershed over time. Whether it’s the wildfires that burned in the Blue Ridge Mountains, low water flows in backyard streams, flooding in urban neighborhoods or extreme hot temperatures, we are interested in hearing stories from the people who live, work and play near the Chattahoochee River. We’d like to share your stories online — and with your permission — use some of the stories in an upcoming documentary. We are not looking for anything fancy. Using your smartphone to record yourself while standing near your creek, lake or river and pointing out changes is fine. In fact, it’s great! Photography/Audio Release. 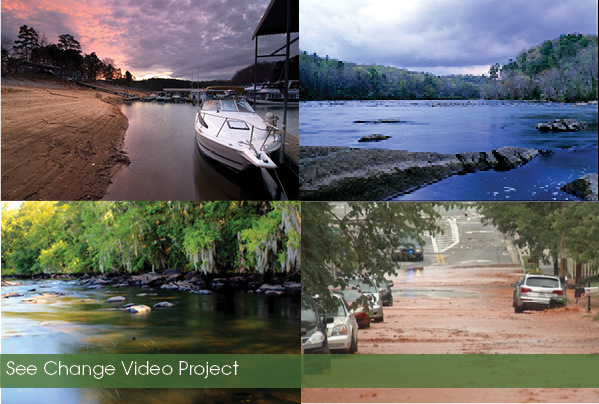 By submitting a video to the See Change video project, you grant and convey to Chattahoochee Riverkeeper, Inc. all rights, titles, and interest in and to any and all photographic images, video or audio recordings, and thereby consent to Chattahoochee Riverkeeper, Inc.’s use of these photographs and/or recordings for advertising, promotional or other purposes in conjunction with the Climate Change Conference or other uses. By submitting a video, you further release Chattahoochee Riverkeeper, Inc. and any of its associated or affiliated partners from all claims on account of such use. If you have any questions, please contact Hal Jacobs. “See Change” – West Point, Ga.